Trying Luberon means adopting one of the highest qualities of lifestyle and a calming atmosphere! The Luberon is a vast area with exceptionally varied flora and fauna, outstanding architectural heritage (five of the villages ranked as “Most beautiful villages in France”) and beautiful landscapes. The area is named after the main range; a compact massif with an easy 1100m summit. The northern face is steep and rich in oaks, whereas the villages in the southern Luberon in Vaucluse overlook the tranquil course of the Durance river. 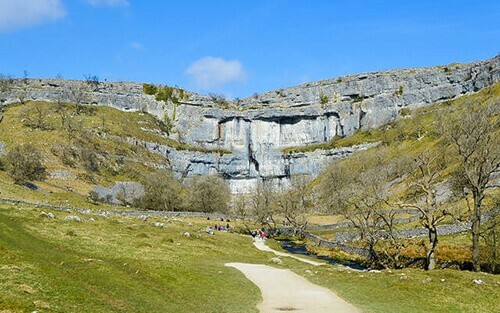 Sun-gilded drystone walls, ochre-washed homes, terraced fields and shady squares with gurgling fountains all contribute to the warm and gentle lifestyle which dominates here. Artists and craftspersons hone their talents in each village. Vineyards and cherry orchards dot the hillsides, and the plains are planted with gorgeous fruit, including one of the jewels in Vaucluse’s crown, the melon from Cavaillon. Abundant flora and fauna are protected by the Luberon Regional National Park, one of the best conserved natural park in France, which covers most of the territory here. On your walk, the Ochre Trail in the Provencal Colorado in Rustrel are good ways to discover the geological phenomenon of the ochre sands and the contrast with the deep blue of the sky and the intense green of the vegetation adds to the beauty. Plant and garden lovers will delight in the terraces at the Château de Lauris. This trip has been designed for people who want to experience some of the most interesting and chilled-out French culture. You will discover Provence differently through sun-drenched fields, fragrant lavender, rustic villages buzzing with cicadas. The hilly countryside is exceptional; rich in almonds and apricots, olives and grain. There can be no doubt that this is Provence! Situated 18 km south-east of Luberon on the southern border of the Vaucluse and the Bouches du Rhône. The village which is 200 metres above sea-level can contemplate the vast plain of the Durance right across to the gentle hills that hem in its southern limit. 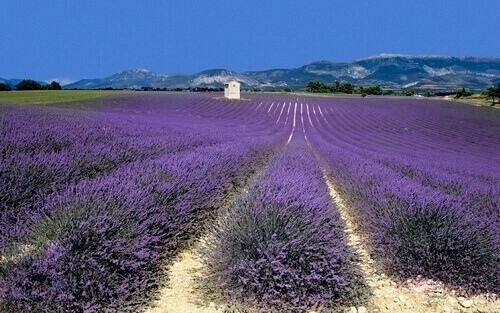 After leaving the historic centre of Merindol and these chronograms from the 17th and 18th century on some facades, you enter into the “Lavender Country”: a mass of colours between the sun, the sky, the Lavender and the Provencal Colorado. 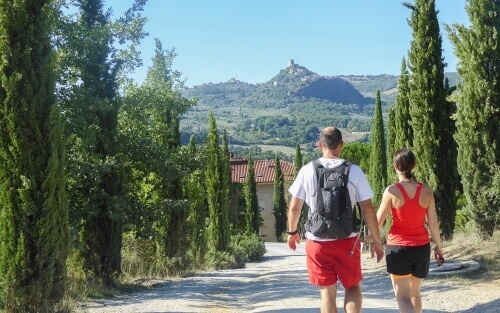 For your first day, you will walk in circular way Gorge de Regalon, through the Parc Régional du Luberon with its unspoilt nature, these impressive mountains and wild forests. 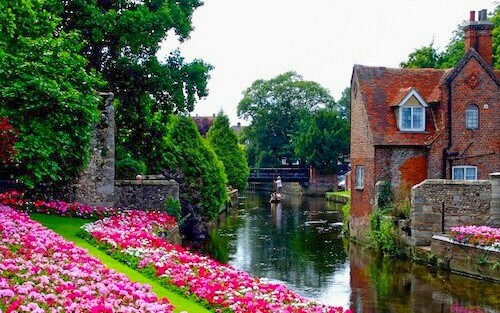 Moreover, you will discover along winding roads lovely and ancient villages, many with castles, forts, ruins, towers, and other geographical and historical sites. Special note: Gorge du Regalon are closed so far. You can still hike in this area but it could be dangerous. To reach Lauris, you will walk on a small mountainous way where you will be almost in symbiosis with nature and through lovely landscapes and peaceful atmosphere. You will pass through superb small villages surrounded by hills and plateaux lit up by the sunshine and where the scent of lavender is everywhere in the wind. It’s really worth the discovery! “One of the most beautiful villages in France”, Lauris sits atop a rocky ridge between the Durance and the Luberon Mountain. Perched on its cliff, Lauris offers an amazing view across the Durance valley, the Alpilles range and the Luberon. Like the figurine on the prow of a ship the XVIIIe century château rises straight from the rock and dominates superb hanging gardens where pools and lakes have kept all their charm. After some kilometres on the way, you will arrive in Lourmarin, a charming village, which cuts the mountains in two parts and allows discovering an authentic Provencal village. Outside the village is the 15th-century Chateau de Lourmarin. After visiting Lourmarin, reaching the “Sommet de Gibes” and continue until Buoux. The small village of Buoux is situated among the rolling hills in the heart of the Parc Naturel Régional du Luberon. 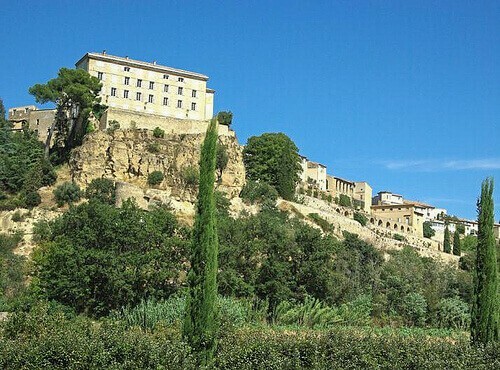 Due to its geographic situation, the village has played a naturally defensive role since prehistoric times as witness the Buoux Fort at the top of the rocky spur. During this stage you will walk along the irregular contours of the Aigue-Brun river, could enter in some natural caves and admire steep cliffs: a paradise for climbing enthusiasts! Saignon has the most distinctive outline of any Luberon village, with its rock squared off by nature as if to look from afar like an impregnable castle. It acts as a signpost high above the town of Apt, hence perhaps the name Saignon, which comes from ‘signum’, Latin for ‘sign’. When you will leave this pretty village, perhaps you will have a chance to see Montagne de Lure, a glimpse of the Alps and even Avignon if it is a clear day: a really majestic view. In the middle of this stage, you could see “Les Ochres Provencal”, impressive fiery red and yellow-green cliffs. Apt is situated in the heart of the Luberon Nature Park, between the mountains of Vaucluse and Luberon. This pleasant city, so typical of Provence, is well reputed for its local products; it even boasts the classification of “site remarquable du gout” (a place of wonderful tastes). We can arrange extra nights anywhere (in Avignon for example) on the itinerary after your last walking day. We can also arrange a station/airport transfer. Please get in touch: info@onefootabroad.com for more info. Best airport is Marseille Other possible airports: Paris Orly and Paris Charles De Gaulle. By plane – Marseille Airport, 60 km south of Merindol’s downtown. By bus: Details on prices and time on the sncf website. See our options in Dates & Prices. Closest international airport to Apt is Marseille Provence Airport. It is 95km from Apt. Walk from Apt to the town of Mazan (it takes about 15 minutes). You will then need to take the bus from Mazan to Carpentras Terradou. Once in Carpentras Terradou, take the train to Avignon TGV. When you arrive at Avignon TG, you will need to take another train to Aix-en-Provence TGV. Finally, take the bus from Aix-en-Provence TGV to Marseille Provence Airport.